Small Molecule Enrichment Flow-Thru Plates are the ideal equipment for vacuum/centrifuge powered SPE of small volumes of sample using various types of media (for applications like high throughput screening, drug metabolite analysis, etc). 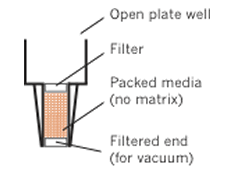 The Flow-Thru Plate’s unique design allows sample to flow from the top of the well, through the chromatographic bed, and out the bottom of each well. Sold in packs of one 96-well plate. Click the button below to add the Small Molecule Enrichment Lab-in-a-Plate Flow-Thru Plate to your wish list.